Woot! It feels like I’ve been working on this one for months, but it’s worth it! 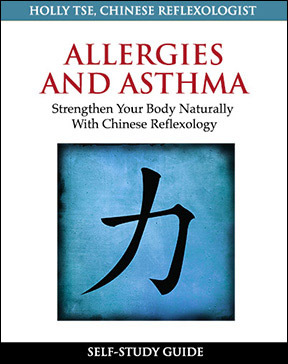 I’m delighted to let you know that I’ve published the Chinese Reflexology self-study guide on Allergies and Asthma. If you’d like to be free from allergies without having to take drugs or allergy shots for years, then find out how to strengthen your body’s Qi (life force energy) so that you can breathe clearly every day of the year. You’ll learn Chinese Reflexology points that can give you instant relief from symptoms as well as “powerhouse” points that help build your body up over time to bring you back in balance with nature. The study guide includes an eBook in PDF format and formats for mobile devices, plus a 12-minute instructional video of the reflexology points covered.